Another week of exemplary reporting. Editor-in-chief David Remnick literally overnight called on his years of experience reporting from Russia to post on the magazine’s website his amazingly thorough, thoughtful, deep Talk of the Town piece on the Tsarnaev brothers and the Chechen culture they came from. With his typically tenacious reporting and dry-eyed scrutiny, William Finnegan reports (“The Deportation Machine”) the horrific story of Mark Lyttle, a 35-year-old biracial mentally ill American citizen from North Carolina, who — through a series of bureaucratic mishaps that even Kafka might have considered far-fetched — was deported, shoved across the Mexican border with three dollars in his pocket, and forced to spend four months wandering (sometimes on foot) through Central America until the American Embassy in Guatemala contacted his family and sent him home. Except that he was arrested at the airport in Atlanta under the assumption that his newly issued passport was a fake. Then there’s Luke Mogelson’s “Letter from Aleppo,” a soul-wrenching dispatch from the bloody midst of Syria’s raggedy civil war. Mogelson’s piece focuses on the people who have assumed the task of burying the corpses that get pulled out of the River Queiq that runs through Syria’s largest city (234 in recent months) and the heavily-traveled bridge on which Syrian Army snipers shoot commuters “in order to bait rebel fighters and would-be rescuers,” except that most of the victims turn out to be women, children, and old men who can’t run fast enough to escape. I confess that after reading Finnegan’s and Mogelson’s pieces, I was relieved to turn the page and read Ian Parker’s profile of filmmaker Noah Baumbach. 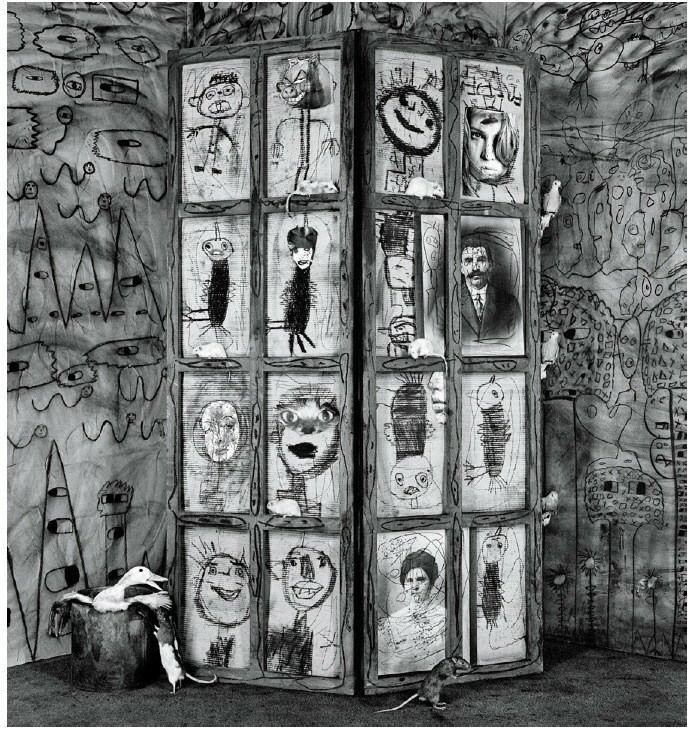 Also in the issue: excellent piece about writing by echt New Yorker staffer John McPhee, who makes a case for the dictionary being a writer’s best friend; a portfolio of pieces (including “Onlookers,” below) by photographer Roger Ballen, whose images fueled Die Antwood’s stunning music video “I Fink U Freeky”; and a column in the Current Cinema department that reminds me that the way to brighten anyone’s day is to read aloud Anthony Lane’s movie reviews out loud.